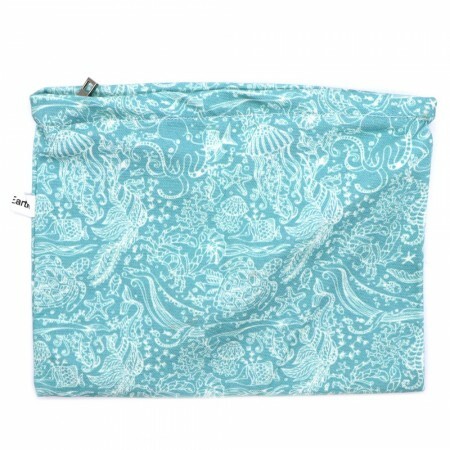 The 4MyEarth food bag is a reusable alternative to single use plastic and clip seal bags. The interior of the bag contains a food safe biodegradable coating, keeping food fresher for longer. Perfect for storing food in the fridge, or for taking snacks on the go. Lightweight, strong & washable. Ocean life design. Great alternative to clip seal bags and plastic wrap, especially with concerns about plastics and their effects on our bodies (such as preservatives 320 & 321). Replaces single use plastic bags and wraps. Can be reused as a toiletry bag or pencil case at end of life. Reusable food pouch zipper closure. Thin and breathable, non-toxic plant based lining so as not to breed bacteria. Easy to open and close little fingers. Simply fold down and seal with Velcro. PVC free, lead free, BPA free, phthalate free and FDA food safe approved. Cotton canvas with a with a non-toxic biodegradable coating, zip. Approx size 25 x 20cm. Browse our other Reusable Food Wraps and Covers.